San Diego, Calif., April 19, 2016 – A wide-ranging coastal research project in Mexico, co-directed by the University of California San Diego’s Dominique Rissolo, was recently awarded a $232,000 grant from the National Science Foundation’s Behavioral and Cognitive Sciences Division to study the complex interrelationships between the ancient Maya and their dynamic coastal environment. Dominique Rissolo, special projects coordinator for CISA3, spent the better part of a month this past winter along the wild and largely unstudied north coast of Quintana Roo, Mexico co-leading Proyecto Costa Escondida. Rissolo, special projects coordinator for the University’s Center of Interdisciplinary Science for Art, Architecture and Archaeology (CISA3), spent the better part of a month this past winter along the wild and largely unstudied north coast of Quintana Roo, Mexico. His team’s Proyecto Costa Escondida (or Hidden Coast Project) is an investigation of environmental and ecological factors that affected ancient Maya ports in Quintana Roo, located on Mexico’s Yucatan Peninsula. The ports’ significance stems from their erstwhile importance in a network of trade routes linking people, goods and ideas from across Mesoamerica. Accompanying Rissolo during the fieldwork were co-Principal Investigators, Jeffrey Glover (Georgia State University) and Beverly Goodman (University of Haifa), as well as their students. Co-PIs Patricia Beddows (Northwestern University) and Derek Smith (University of Washington) will be joining the field season this spring as well. 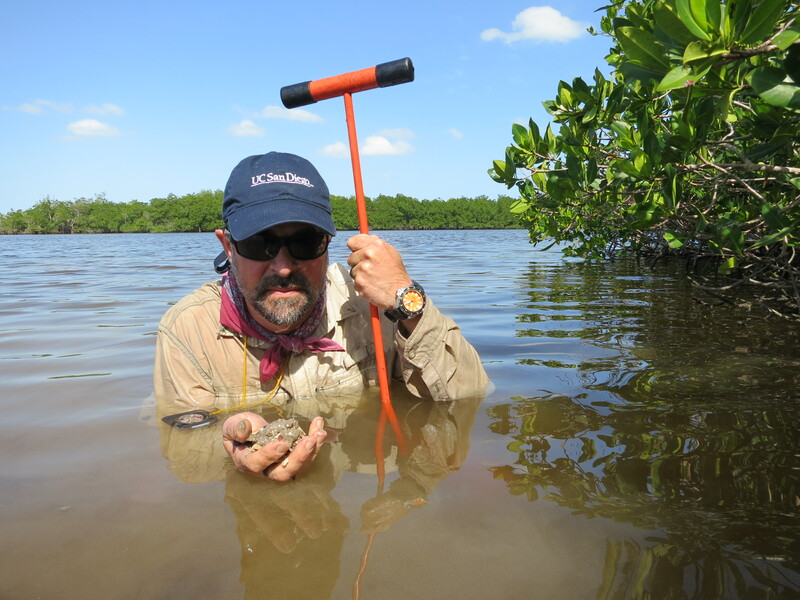 This interdisciplinary research program – involving faculty, students and staff from six universities in the U.S., Mexico and Israel – is largely focused on a paleoenvironmental and paleoecological reconstruction of the key port of Vista Alegre, a mangrove-shrouded island surrounded by a mosaic of coastal ecosystems. Geoarchaeological field methods, such as sediment coring, water sampling, and micro-fossil analyses, enable Rissolo and his colleagues to better understand sea-level fluctuations as well as the way the shoreline and harboring locations have changed over time. Changes in ecosystem biodiversity would have presented the maritime Maya with unique challenges and opportunities, says Rissolo, who is based at the UC San Diego Qualcomm Institute. He notes that coastal-inland connections served as a catalyst for creating more socially complex societies, and the scope and scale of maritime commerce and interaction was closely linked to the ever-changing political and economic landscape. Dominique Meyer (Physics) and Sebastian Afshari (Mechanical and Aerospace Engineering), along with several other UC San Diego students, have been active in shaping the course of the research. Six students and staff from UC San Diego – including Sebastian Afshari (Mechanical and Aerospace Engineering), Michael Hess (Structural Engineering), Aliya Hoff (alumna, Anthropology), Eric Lo (QI engineer), Dominique Meyer (Physics) and Vera Smirnova (Chemistry and Biochemistry) – have also been active in shaping the course of Proyecto Costa Escondida research. 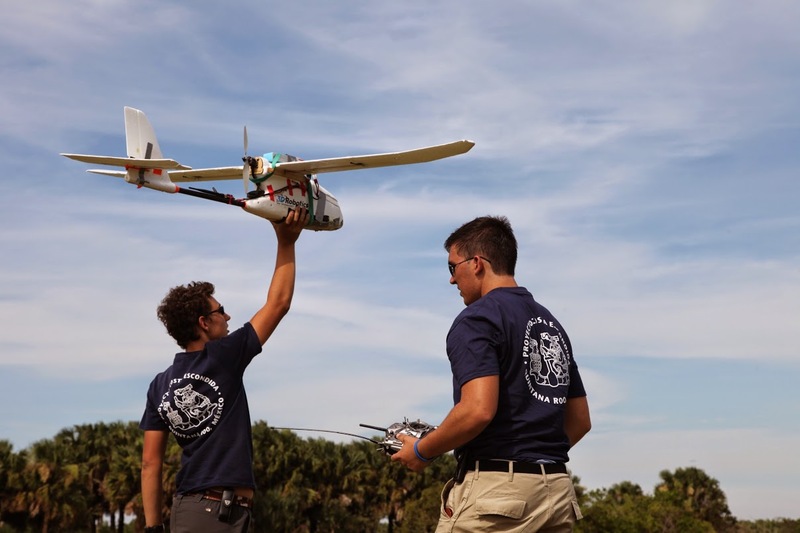 Integral to the project is the characterization and modeling of the coastal landscape via aerial remote sensing techniques. Meyer recently published an article on this student-driven effort in the March issue of the SAA Archaeological Record. The project’s team from the University of Haifa wrapped up their underwater coring activities in February, with technical support from local divers Gosia Pytel and Jeff Clark. Analyses of the sediments back in Israel will give researchers a better understanding of coastal processes over time. Haifa graduate student Rohi Jaijel completed the first phase of the sub-bottom profiling sonar survey in the waters around Vista Alegre. Ultimately, the team hopes to find an intact Maya trading canoe buried beneath the sediments of the ancient harbor. During the time of the powerful Maya center of Chichen Itza, coastal trading ports like Vista Alegre would have been visited by countless canoes carrying commodities like salt and cotton, but also more valuable cargoes such as cacao, obsidian, jade and finished prestige items. Though observed by Christopher Columbus during his forth voyage to the Americas, these massive Maya dugouts remain elusive in the archaeological record. New discoveries at the site are beginning to tell the story of a cosmopolitan port center actively engaged in facilitating commerce during the latter part of Maya civilization. Both artifacts and architectural styles reflect a small coastal community connected to cultures far and wide. Excavations – led by Mexican archaeologists Nelda Issa and Ashuni Romero, with Verna Gentil, Chrissy Phillips and Carrie Tucker – have revealed an astounding density of materials beneath the surface of the site. Rissolo notes that the team has discovered the skeletal remains of the ancient residents of Vista Alegre as well. “In fact, it is difficult to excavate at the site without encountering an intact burial, or mixed human bones from a burial that was disturbed at some point in the past,” he says. Such contexts require special care and Rissolo and team are collaborating with biological anthropologists at the Autonomous University of Yucatan, Vera Teisler, Andrea Cucina and Julio Chi Keb.